Police said two men stole 19 iPhones from the SoHo Apple store. 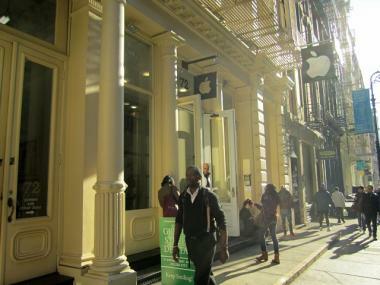 SOHO — A man dressed like an Apple store employee managed to steal 19 iPhones from the tech behemoth's SoHo location last week, police said. Police said the thief "dressed similarly" to store employees — who usually wear blue T-shirts imprinted with an Apple logo — and walked right into an electronics repair room at about 5:30 p.m. on June 1. The man grabbed 19 iPhones from a drawer inside the room, worth a total of $16,130, then handed them over to another thief. That man hid the phones under his shirt, and the pair walked out of the store. Police were still investigating the incident. Apple did not immediately return request for comment.